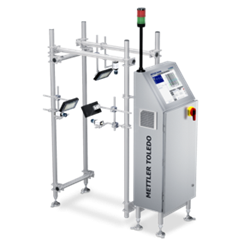 Mettler-Toledo, one of the market leaders in product inspection technology, has recently made some improvements to its V2630 vision inspection system. This turnkey system inspects labels, prints, and packaging properties fully automatically, and, thanks to its modular design, can be flexibly adapted to the requirements of different production lines and extended as needed. The high-end version of the V2630 was shown off at the Interpack trade show in May, and since then has seen an increase in consumer interest. Thanks to its modular design, the V2630 visual inspection system can be extremely flexibly adapted to a wide range of requirements for inspecting aligned packages. The V2630 supports product control with up to five high-performance cameras and ten lights that can each be individually positioned. The Mettler-Toledo CIVCore software analyzes the image data. CIVCore checks whether text information, such as the weight and ingredients, and graphical elements like barcodes, logos, or dot matrix codes and labels are printed completely, correctly, and legibly on the packaging. The software also checks additional important packaging properties, such as the clean application of the labels, the correct closure of the box, and the fill level of the product. The Rapid Fit frame for the V2630 system allows for quick installation above existing production lines, thereby eliminating the need to reorganize or interrupt the existing production line layout. Adjustable mounts for cameras and lights make it easy to check different package sizes. If the inspection requirements change, the system can be easily extended. The cameras and the operating terminal for the inspection system are available in a version with an IP65 rating for use in washdown environments or harsh ambient conditions. The V2630 inspects every single package for any defects. If the system detects a faulty product, this product is excluded from the production line using reliable product tracing. The V2630 can be configured to send out an automatic alarm or shutdown signal to the production line once a preset number of consecutive product errors or a negative trend has been identified. With this approach, the V2630 reduces the number of product rejections due to user mistakes after an item is changed, system malfunctions, or other process errors. The V26 product line includes the V2622 Flex-Lite, V2612, and V2630 visual inspection systems. The V2622 is the entry-level solution for inspecting aligned products and is based on smart cameras with or without a tracking function. The components are suitable for installation in even the tightest of spaces on packaging machines and production lines. The V2612 is the mid-range solution in the V26 range and is designed for the inspection of flat, aligned products. The V2612 also marks the entry point to the performance class of product inspection and quality control with the METTLER TOLEDO CIVCore inspection software.